Risk Manager in Residence Program at University of Louisiana - Monroe: Michael Phillipus (2nd row on the right end) with a group of our students after a lunch. More than 60 students attended his lunch presentation. 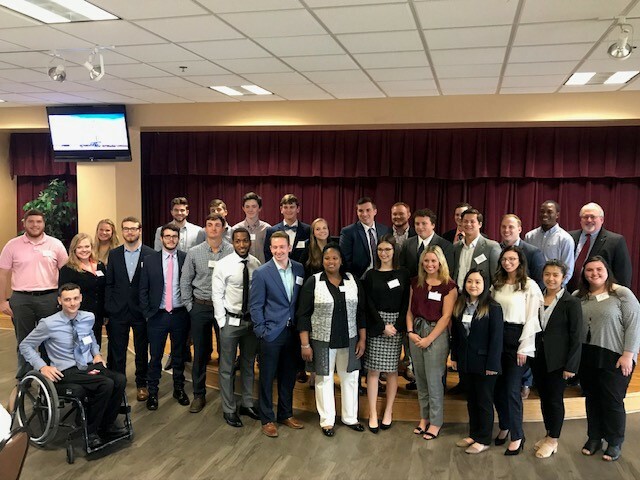 He also spoke to more than 100 students in the Business 1001 class, 18 in the Business Risk Management class and more than 70 people at a reception that the Spencer grant sponsored. The following colleges/universities were given $4,000 grants to bring a risk manager to their respective campuses. Also listed is the risk manager who visited the school. Missouri State University — Jeffrey Strege, Sysco Corp.
Ohio State University — Lawanda Hall, BMW Manufacturing Co.
University of Calgary-Alberta — Radu Demian, Prologis, Inc.
University of Central Arkansas — Dan Kugler, REV Group, Inc.
University of Louisville — Andrew Baillie, The AES Corp.
Florida State University -- Jeffrey Bray, Prologis, Inc.
LaSalle University -- Lori Badenhop, FedEx Corp.
St. John's University -- Mari-Jo Hill, SAS Institute, Inc.
University of Akron -- Lance Ewing, Cotton Holdings Inc.
University of Louisiana - Lafayette -- Kristy Coleman, Turner Broadcasting System, Inc.
University of Oregon -- Andrew Bent, Sage Software, Inc.
Virginia Commonwealth University -- Jacques Arragon, The Irvine Co.